Buckle up, because I'm about to take you on a wild ride! 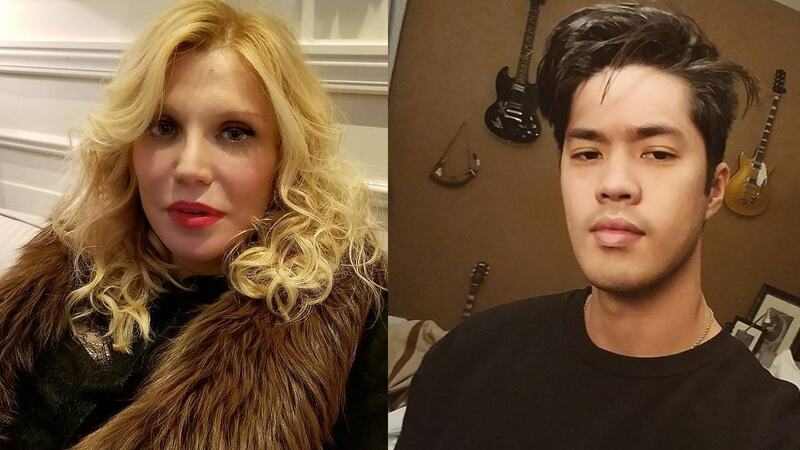 According to People, Frances Bean Cobain's ex-husband, Isaiah Silva, is claiming her mother, Courtney Love, conspired to have him killed in order to get Kurt Cobain's guitar back. Oh, and this allegedly also involves 13 Reasons Why actor Ross Butler, too. According to a copy of the civil complaint obtained by the site, Silva is suing Love, Butler, her manager Sam Lutfi, private investigator John Nazarian, musician Michael Schenk, and others for "conspiring to kill him with the intent of stealing the Nirvana frontman's guitar." Silva is also alleging the group engaged in "burglary, robbery, sexual battery, kidnapping, attempted murder, criminal threats, false imprisonment, extortion, stalking intentional infliction of emotional distress and trespass," according to People. "The primary objective of their conspiracy was to locate and take possession of a guitar believed to be worth millions of dollars, which was gifted to Silva, by [Frances], on January 8, 2014, six months prior to their June 29, 2014 marriage," the documents allege, according to Us Weekly. As part of his divorce settlement with Bean Cobain, Silva got to keep the famous guitar, which Cobain played during his iconic 1993 MTV Unplugged performance. Cobain died the following year by suicide. Reps for Love, Nazarian, Schenk, and Yuhktman did not immediately respond to People's request for comment.